Shaping State Laws With Little Scrutiny Members of a private alliance of corporations and lawmakers called the American Legislative Exchange Council have helped write hundreds of new state laws, including Arizona's immigration measure. CORRECTION: A list of lawmakers appearing with this article mistakenly said that Utah state Rep. Paul Ray, the current public sector chair of an ALEC task force, was a former ALEC staff director. When you walk into the offices of the American Legislative Exchange Council, it's hard to imagine it is the birthplace of a thousand pieces of legislation introduced in statehouses across the county. Only 28 people work in ALEC's dark, quiet headquarters in Washington, D.C. Michael Bowman, senior director of policy, explains that the little-known organization's staff isn't writing the bills. The real authors are the group's members — a mix of state legislators and some of the biggest corporations in the country. "Most of the bills are written by outside sources and companies, attorneys, [and legislative] counsels," Bowman says. Here's how it works: ALEC is a membership organization. State legislators pay $50 a year to belong. Private corporations can join, too. The tobacco company Reynolds American Inc., Exxon Mobil Corp. and drug-maker Pfizer Inc. are among the members. They pay tens of thousands of dollars a year. Tax records show that corporations collectively pay as much as $6 million a year. With that money, the 28 people in the ALEC offices throw three annual conferences. The companies get to sit around a table and write "model bills" with the state legislators, who then take them home to their states. Each of these state legislators sat on ALEC's Public Safety and Elections Task Force, which drafted language of a bill that became Arizona's SB 1070. Original author of SB 1070. Brought draft of bill to ALEC to create model legislation. If re-elected, Pearce plans to run for president of the Arizona Senate. As public sector chair, was the top lawmaker on the board of ALEC's task force. If re-elected, Ray plans to co-sponsor a bill in Utah similar to Arizona's SB 1070. If re-elected, Driver expects to support a bill — similar to SB 1070 — that Reps. Debbie Riddle and Leo Berman plan to introduce next session in Texas. Was present at the ALEC task force meeting when model bill was drafted. Sen. Flory does not expect a similar law in her state. Lost the Republican primary for state Senate. Has attempted to pass immigration-related bill, but would not support a bill identical to Arizona's SB 1070. ALEC's Bail Bond Subcommittee Chairman. Lost the Republican primary to a political newcomer. Strongly supports having a Wisconsin law modeled after Arizona's, as long as it is ruled constitutional. Signed amicus brief in support of Arizona's SB 1070, filed in September, 2010, in the U.S. Court of Appeals for the Ninth Circuit. If re-elected, Rep. Whisnant would likely support legislation similar to SB 1070 if introduced in the future. One of those bills is now Arizona's controversial new immigration law. It requires police to arrest anyone who cannot prove they entered the country legally when asked. Hundreds of thousands of illegal immigrants could be locked up, and private prison companies stand to make millions. The largest prison company in the country, the Corrections Corporation of America, was present when the model immigration legislation was drafted at an ALEC conference last year. ALEC's Bowman says that is not unusual; more than 200 of the organization's model bills became actual laws over the past year. But he hedges when asked if that means the unofficial drafting process is an effective way to accelerate the legislative process. "It's not an effective way to get a bill passed," he says. "It's an effective way to find good legislation." The difference between passing bills and "finding" them is lobbying. Most states define lobbying as pushing legislators to create or pass legislation. And that comes with rules. Companies typically have to disclose to the public what they are lobbying for, who's lobbying for them or how much they are spending on it. If ALEC's conferences were interpreted as lobbying, the group could lose its status as a non-profit. Corporations wouldn't be able to reap tax benefits from giving donations to the organization or write off those donations as a business expense. And legislators would have a hard time justifying attending a conference of lobbyists. Bowman says what his group does is educate lawmakers. "ALEC allows a place for everyone at the table to come and debate and discuss," he says. "You have legislators who will ask questions much more freely at our meetings because they are not under the eyes of the press, the eyes of the voters. They're just trying to learn a policy and understand it." Much about ALEC is private. It does not disclose how it spends it money or who gives it to them. ALEC rarely grants interviews. Bowman won't even say which legislators are members. Is it lobbying when private corporations pay money to sit in a room with state lawmakers to draft legislation that they then introduce back home? Bowman, a former lobbyist, says, "No, because we're not advocating any positions. We don't tell members to take these bills. We just expose best practices. All we're really doing is developing policies that are in model bill form." So, for example, last December Arizona state Sen. Russell Pearce sat in a hotel conference room with representatives from the Corrections Corporation of America and several dozen others. The group voted on model legislation that was introduced into the Arizona legislature two months later, almost word for word. Bowman says that type of meeting is an informational exchange, meant to help legislators understand policy. But first ALEC has to get legislators to the conferences. The organization encourages state lawmakers to bring their families. Corporations sponsor golf tournaments on the side and throw parties at night, according to interviews and records obtained by NPR. Bowman says that's nothing special: "We have breakfasts and lunch. They're at Marriotts and Hyatts. They're normal chicken dinner. Maybe sometimes they get steaks. Yeah, we feed the people. We think that it's OK to eat at a conference." Videos and photos from one recent ALEC conference show banquets, open bar parties and baseball games — all hosted by corporations. Tax records show the group spent $138,000 to keep legislators' children entertained for the week. But the legislators don't have to declare these as corporate gifts. Consider this: If a corporation hosts a party or baseball game and legislators attend, most states require the lawmakers to say where they went and who paid. In this case though, legislators can just say they went to ALEC's conference. They don't have to declare which corporations sponsored these events. Kirk Adams, Arizona's House speaker, went to ALEC's most recent gathering in San Diego. "I have been to ALEC's conferences and they have been pretty educational — the ones that I've been to," he says, adding that the time he spends with corporate executives does not influence his opinions on the issues. "If we were to believe that a dinner with a lobbyist would purchase a member's allegiance to an issue, then we have much larger problems than that," Adams says. "It's just simply not been my experience at all." When asked if he paid his own way to the ALEC conference, Adams acknowledges he accepted money from the group to help pay for the trip. ALEC calls this a "scholarship." Many ALEC members receive these scholarships. But it's not clear who's really paying. Michael Bowman initially said state Sen. Pearce, who also accepted a scholarship, would know who paid for his trip. But the Arizona lawmaker said ALEC paid for it. Later, Bowman said Bob Burns, another Arizona state Senator, would know. Burns was in charge of pooling money for the scholarships. He did not respond to NPR's repeated requests asking where the money came from. In an office at the Arizona statehouse, a review of records show that not one Arizona legislator who went to the conference reported receiving any gifts of meals, parties, golf outings or banquets tickets from a private corporation. Pearce and a dozen others wrote that they received a gift of $500 or more from ALEC. A review of the two dozen states now considering Arizona's immigration law shows many of those pushing similar legislation across the country are ALEC members. In fact, five of those legislators were in the hotel conference room with the Corrections Corporation of America the day the model bill was written. The prison company didn't have to file a lobbying report or disclose any gifts to legislators. They don't even have to tell anyone they were there. All they have to do is pay their ALEC dues and show up. Since Arizona Gov. Jan Brewer signed SB 1070 into law in April, five state legislators have introduced eight bills similar to it. Like SB 1070, four of them were also named "Support Our Law Enforcement and Safe Neighborhoods Act." Lawmakers in many more states NPR interviewed have said they would introduce or support a similar bill. 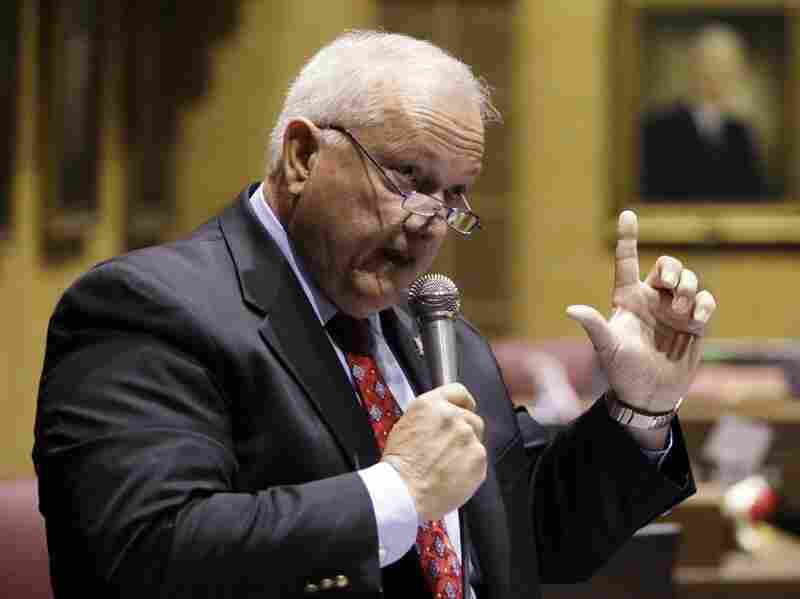 As we reported, Arizona Republican state Sen. Russell Pearce was the originator of the draft legislation that later became the immigration law known as Arizona SB 1070. Although Corrections Corporation of America did have a representative at the American Legislative Exchange Council meeting where model legislation similar to 1070 was drafted, we didn't mean to suggest that CCA wrote the language.